We know that Intel processors use a “little-endian” scheme when deciding how to store binary data in memory. That is, bytes from the “little end” of a number will be stored earlier in memory than the bytes from the “big end”. 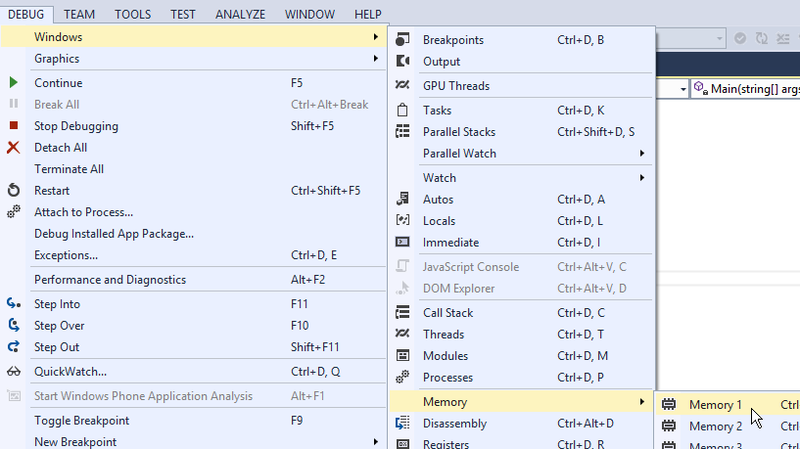 We can see this little-endianness in action by using Visual Studio to look at how a data item is stored in memory. 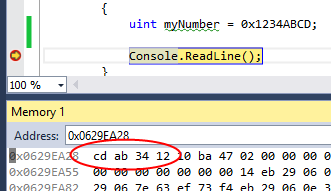 Let’s say that we have a 4-byte (32-bit) unsigned integer with a value of 0x1234ABCD, assigned to a variable named “myNumber”. 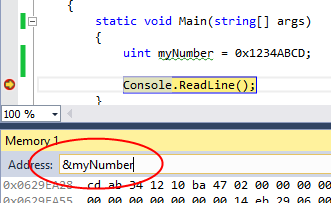 We can view the memory location where this number is stored by bringing up the Memory window in Visual Studio and then entering “&myNumber” in the Address area. When you press RETURN, you’ll see the memory location where myNumber is stored. Notice that the first byte is CD, followed by AB, etc. The number is stored in a little-endian manner.